I recently received an IM from Kitty Barnett recently, asking me if I’d be interested in taking a look at some new features she’s been working on for the upcoming Catznip R12 release which is Coming Soon™. Obviously as someone who has followed (and uses) Catznip (although not as frequently as I use Firestorm, admittedly), I was delighted to take a look. Nor was I alone, Kitty also put together a couple of articles on the features on the Catznip blog, (which you can find under the titles Three Days of Teasers Day #1 and Day #2 – a third part was planned but that pesky thing called the physical world got in the way of Kitty’s plans), and invited Catznip users to have a look. With Kitty’s approval, I’ve summarised those two articles here – and if you are a Catznip user already, and haven’t seen Kitty’s original documents – please hop over to the Catznip blog, have a read & offer feedback. Whenever you buy or grab something you have to click that “Buy”/’Pay”/”Keep” button anyway so wouldn’t it be great if we could just do some pre-sorting right then and there?! It wouldn’t really interrupt the flow of going to an event and hovering up demos or buying things you’re sure you want since you don’t actually have to go to your inventory while you’re at the event and you’d be able to teleport home with an inventory no worse off then when you arrived. 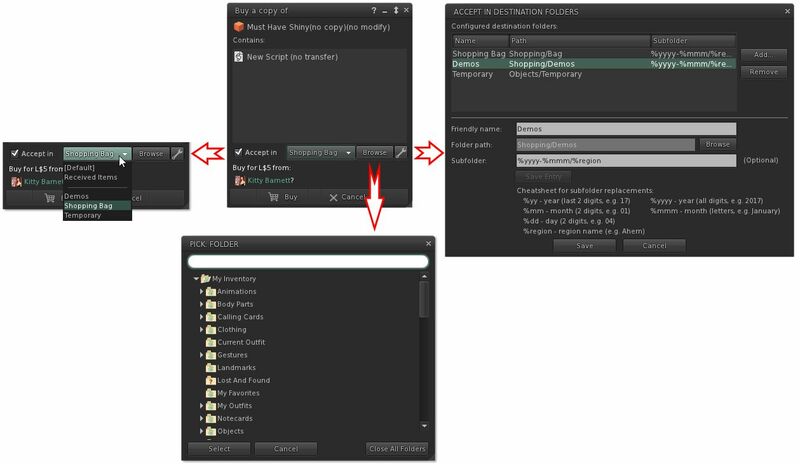 And so with this in mind, Kitty has revised the Buy / Pay floater and the Accept Inventory floater so that they offer you the ability to select where incoming items are going to be stored in your inventory. The options should be fairly self-explanatory. Check Accept in and the remaining options are activated. The drop-down will display a list of folders you have opted to allow incoming items to be delivered (show in the image on the right), the browse button allows alternative from you list of folders in the drop-down to be selected, and the spanner button allows you to establish your list of destination folders. The roadmap of these various options is shown below. 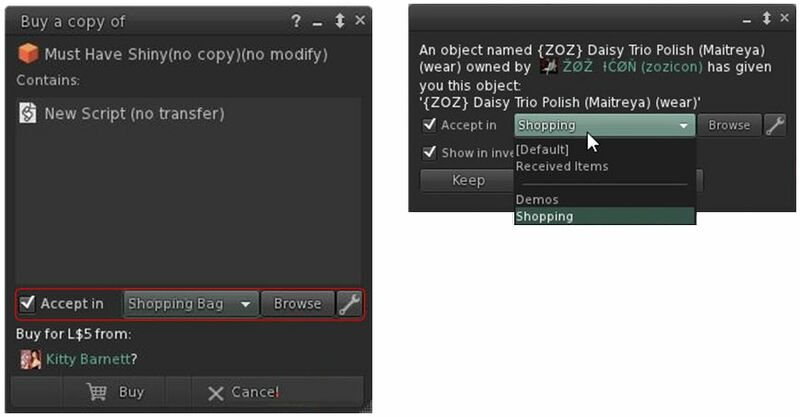 Note only can you select the folders into which you want incoming purchases to go, you can also set Catznip R12 to dynamically create new folders in which to place incoming items. This means, for example, that if you got to a big shopping event at one location, you can set the viewer to deliver all the demo you obtain / items you purchase into folders define by – say – the month in which you got them, and the location where they were obtained. 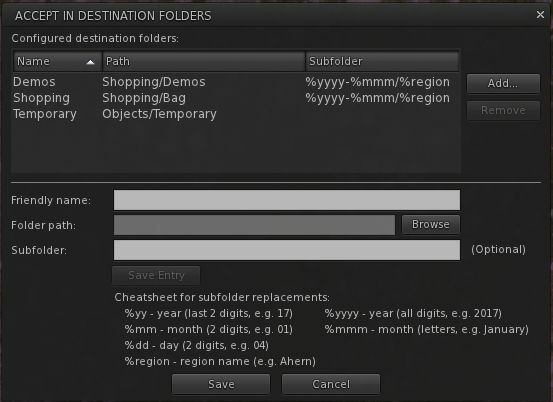 So, for example, if in April you go to shopping event X on region YYYY, and grab a load of demos, and then later in the month go to event A on region BBBB and grab more demos, you can have them delivered to sub-folders in your “Demos” folder, respectively labelled “April 2017 YYYY” and “April 2017 BBBB” – both of which are dynamically created by Catznip as they are needed. So even if you don’t get around to trying them for days after your visit, you can quickly and easily locate the demo items without have for fiddle around searching for folders and objects. Inventory searches can be a pain. Even with the search filters, things are hardly ideal. To help improve things, Kitty has in the past added additional search options to Catznip such as Open Folder In, which considerably eases the pain for further refining searches / making items visible in folder which might otherwise remain hidden as a result of the search term / filters initially used to try to find things. With Catznip R12, she further improves things by adding a new Contents In capability. 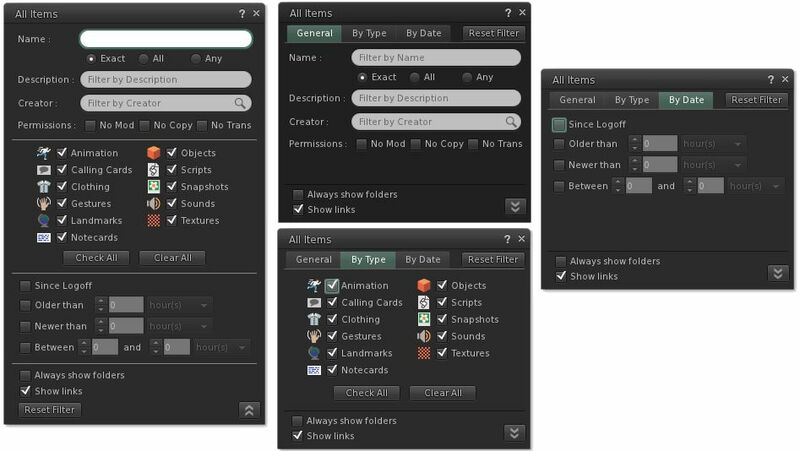 Rather than displaying the results of a search in a separate tab, this option displays the folder(s) matching your search criteria with all of the contents visible, rather than just the items which might match your search criteria, making it much easier to see if the folder(s) contain what you are looking for (particularly where some / all of the items in the folder might not be consistently named, and so might otherwise be masked from view after a search). The New Show Contents In presents a more refined way to see all of the contents in a folder when they might otherwise be masked by the search criteria / filter you have set. Credit: Kitty Barnett. 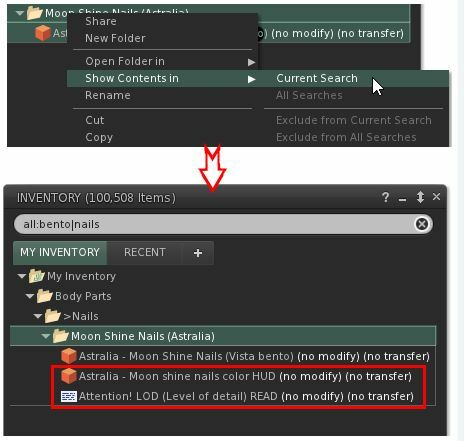 Finally – and not a part of the two articles by Kitty linked-to above – Catznip R12 will see further refinements to the inventory search features themselves, and highlighted in the set of images below. I’ll have more on this when the viewer is ready for release. The Advanced Inventory filter floater for Catznip R12 in its expanded and tabbed forms. I’m not the world’s greatest shopper in many respects. In the physical world, I’ve reach that point in life where I know what I like to wear and am happy wearing it; shopping for fashion or trends passes me by. This is reflected in my SL time as well; I don’t go to the major shopping events, be they fashion or the gacha events. I tend to be targeted in what I’m buying. But, that said, there are times when I can hit a store and go demo-mad, and I find it annoying that depending on how they are delivered, demos can end up anywhere in the top-level of my inventory when delivered as a folder, or get rudely shoved in Objects. I’m also slightly OCD in my inventory management and ordering. Both of these being the case, I’ve long wanted to have the means by which I could better control what goes where when entering my inventory, rather than having to set aside time after (say) an infrequent demo splurge shunting folders and boxes around my inventory. So the new destinations options get a big thumbs up from me. Similarly, inventory filtering and searching has long been in need of refinement, so I’m looking forward to having a play with kitty’s updates in more detail when R12 surfaces. And when might that be? Well, there is still some work to be done before the viewer is ready for a full release – but there is a chance that a preview version might be available on a limited basis in the next few days. In the meantime, Kitty welcomes constructive input on these ideas, so again, if you have any suggestions, comments, additions, or obvious things that could be added (keeping in mind that if you’re not a Catznip user then there are already quite a few inventory/appearance features that you might not be used to) – she’d like to hear from you. Drop your comments here or – better – on the Catznip blog posts, which I’ll again linking to below to save scrolling.